I have been the very fortunate recipient of blog giveaways! I won from Out of the Flames, Eats Love and Happiness, Inspirational Beading and Treasures Found :: Inspiration is Everywhere (I hope I'm not forgetting anyone!). I can actually do these in any color - so if you win and you don't like this color scheme let me know and if my stash allows - I can do any color (and silver if you prefer!). If you are a beader, you can win this bead kit! (This was part of a HUGE win I received from Erin at Treasures Found::Inspiriation is Everywhere....Erin said if I couldn't use it all to pass it along...). This is a kit with a lampwork bead and an enamel bead from EB Bead and Metal Works. Also included are some light siam crystal and some large (about 12mm I think) brown glass pearls. All you have to do enter to win is leave a comment and let me know "earrings" or "kit" drawing! In other beady news, I'm making some progress on the piece from my own kit/challenge(Spring Fling!). Here's a sneak peek! I'm having so much fun with this kit, and I hope all the other participants are too! Be sure to come back on the R day of the Blogging from A-Z challenge for the Reveal (April 20th)! Looking forward to starting my Beading Babes ruffle bracelet this weekend too! Thanks for coming by! I will draw a winner for the earrings and kit next Saturday April 14th. I would love to win this kit! I've been wanting to work with these colors! Thanks for the awesome blog. I always enjoy reading! What a great idea, to use the letter "G" for a blog give away! Love the kit, Amy. The lampwork bead is beautiful. How clever to use G for giveaway. The kit looks wonderful. The colors are so yummy. Nice use for G! You don't need to put me in the drawing. I'm trying to visit all the A-Z Challenge Blogs this month. Kit would be awesome.Great use of the letter G.
Hi Amy, Great use for G day is a giveaway. The kit looks wonderful. I am enjoying stopping by each day to see what you have posted next. Nice giveaway!!!!!!!!! Very pretty kit!!! Thank you. Happy Easter!!!! I have been enjoying your Blogging from A-Z series! The kit would be awesome! I have been having fun following your daily blogs and even some of the other A to Z blogs. But I have to say that the ones about beads (like yours, with lots of pictures) are my favorites of course! And I would love to be entered to win this kit...that Lampwork bead and the Enamel bead are both so awesome! I rarely work with anything larger than seed beads so I don't really have a great collecton of larger/focal beads or Lampwork beads...that's something that I need to remedy soon! Thanks for introducing me to this A to Z blog hop...such a great way to find some great blogs to read! Hi Amy, I would love to win the kit. I'm sure I could do something with that! Thanks for having the giveaway!. Hey there, what a lovely giveaway! I was originally considering using the same word as you for the letter "G" but decided to put it on a different day. I would absolutely love to win the beads-- count me in! Ohhh I'd love the kit as I am a beader but I'd also love the earrings as I am a fan of those too...but I suppose as I am a beader then the kit it will have to be! 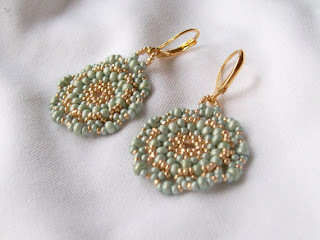 Loving your A-Z posts, especially as they relate to beading! 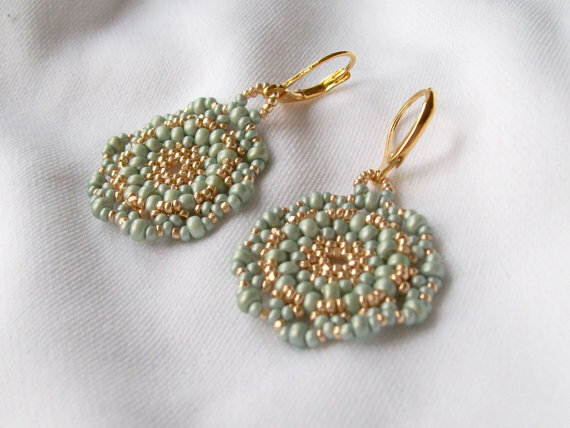 And earrings, definitely, because the one thing I'm not is crafty - just an admirer of other people's good work! Oh you so know I want want want that kit! I am looking at my Spring fling kit today and am truly very pumped to see what it wants to be. Beading Babes Reveal - Project(s) 4! Blogging from A-Z || F || Friends & Free pattern! Blogging from A-Z || E || "Embaby"